It is true that opposites attract--for a while. But often as the years go by in our marriages, opposites may also begin to attack. The habits and characteristics we once found endearing about our significant other are the exact things that drive us crazy years later! Whether you and your spouse disagree about finances, parenting, or how to load the dishwasher, your differences don't need to divide you. They can actually bring you closer together--and closer to God. 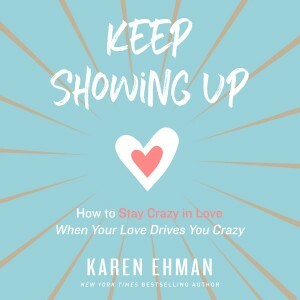 In Keep Showing Up, Karen Ehman shows you… How to play to each other's strengths as you work on your own weaknesses The difference between having a soul mate and having a sole mate How to become a faithful forgiver who also forgets Strategies for avoiding the social media comparison trap Why it's dangerous to mimic a friend's marriage How to unearth the magic in the mundane Why a spouse who drives you crazy can drive you straight to Jesus Throughout Keep Showing Up, Karen includes ideas to implement in your marriage right now, such as powerful statements to speak to your spouse, date-night-on-a-shoestring suggestions, and discussion starters. Discover how your 'incompatibility' can become the strength of your marital team in this real-life guide to both living with and loving your spouse--differences and all. Bible verses to encourage your marriage, printable reminder quotes, and questions to discuss with your spouse are available in the audiobook companion PDF download. The Bible Study Source series provides a unique audio learning experience. 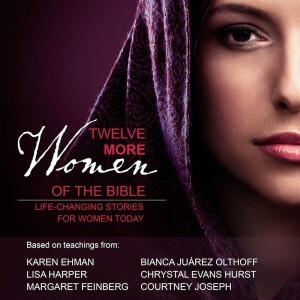 Unlike a traditional audiobook's direct narration of a book's text, Twelve More Women of the Bible includes high-quality, live audio sessions from the authors that cover this important Bible-based topic. These sessions will reflect the ambiance of the unique recording locations, immersing the listener into the teaching. You will hear from Lisa Harper, Karen Ehman, Chrystal Evans Hurst, Margaret Feinberg, Bianca Juarez Olthoff, and Courtney Jospeh as they look at the spiritual lessons learned from twelve women in the Bible and what they mean for you today. You will learn about the successes and failures of such women as Debroah, Esther, Anna, Ruth, the Shulamite woman, the Proverbs 31 woman, Puah and Shiprah, and others to see how they drew near to God in the midst of trials, and learn how they overcame rejection and disappointment. Their stories will inspire you to persevere through difficult times and find joy in the hope that Jesus has provided. This humorous, yet thought-provoking book guides you as you discover for yourself the freedom and reward of living a life “out of control,” in which you allow God to be seated in the rightful place in your life. 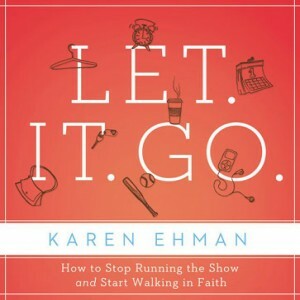 Armed with relevant biblical and current examples (both to emulate and to avoid), doable ideas, new thought patterns, and practical tools to implement, Let It Go will gently lead you out of the land of over-control and into a place of quiet trust. You’re busy and tired and craving peace—and you’re not alone. 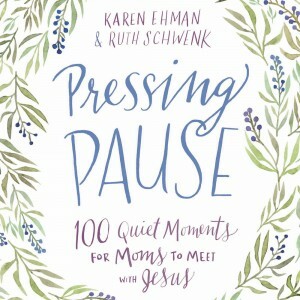 Whether you’re a stay-at-home mom who has a list of seventeen errands to do between dropping the kids off and picking them up, or the working mom who’s day job is just as tough as your mom job, or the brand new mama who is experiencing the pain and joy of motherhood for the very first time—Pressing Pause: 100 Quiet Moments Where Moms Can Meet with Jesus is for you. These 100 devotions for moms focus on moving from just making it through to making a real difference and not losing yourself along the way. In order to have this seismic shift in perspective, a mom needs to drink deep from the well of God’s word each day, filling her spiritual reservoir enough to then pour out into the lives of her husband, children, and others with whom her life naturally intersects. This can only be done with regular times spent alone with God, drawing on His power, ingesting His word, and learning to love and serve more like His Son. Sound like a tall order? A time commitment you just can’t handle? These simple, accessible devotions offer you a brief moment of respite in your busy day, taking just enough time to center your heart and mind on what God has for you as His beloved daughter. Press pause on the chaos and find your rest. You're busy and tired and craving peace - and you're not alone. 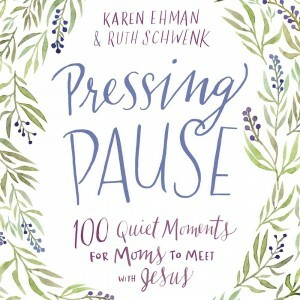 Whether you're a stay-at-home mom who has a list of 17 errands to do between dropping the kids off and picking them up or the working mom whose day job is just as tough as your mom job or the brand-new mama who is experiencing the pain and joy of motherhood for the very first time, Pressing Pause: 100 Quiet Moments for Moms to Meet with Jesus is for you. These 100 devotions for moms focus on moving from just making it through to making a real difference and not losing yourself along the way. In order to have this seismic shift in perspective, a mom needs to drink deeply from the well of God's word each day, filling her spiritual reservoir enough to then pour out into the lives of her husband, children, and others with whom her life naturally intersects. This can be done only with regular times spent alone with God, drawing on his power, ingesting his word, and learning to love and serve more like his Son. Sound like a tall order? A time commitment you just can't handle? These simple, accessible devotions offer you brief moments of respite in your busy days, taking just enough time to center your heart and mind on what God has for you as his beloved daughter. Press "pause" on the chaos, and find your rest. 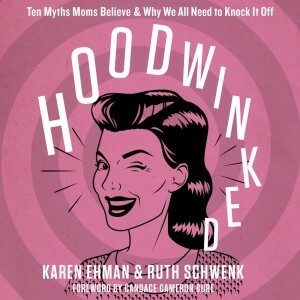 Moms have been hoodwinked—tricked into believing lies that keep them from not only enjoying motherhood, but forging friendships with other moms who might tackle the tasks of motherhood differently. Myths such as “Mothering is natural, easy, and instinctive” cause moms to feel like failures if they have questions or apprehensions in raising their kids. Operating from the premise that “The way I mother is the right (and only) way” puts up fences between moms instead of building bridges of encouragement between them. Lies such as “I am my child’s choices” tempt moms to mistakenly believe that if their child makes a wrong choice then they, in turn, must be a bad mom. 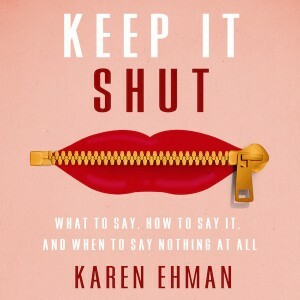 In their encouraging “we’ve been there” style, Karen Ehman and Ruth Schwenk enable mothers to: Identify the ten myths of motherhood our current culture perpetuates Replace the lies with the truth of what God says in the Bible about mothering Acquire practical tools to help them form new and improved thought patterns and healthy behaviors Forge healthy, supportive relationships with other moms of all ages and stages Confidently embrace the calling of motherhood as they care for their families in their own unique way A six-session video Bible study for group or individual use is also available.